I suspect that these words, said over two decades ago in my home country, would resonate with many here in Sri Lanka. For years, the government has thrived as a basically closed system. An advisor to the United National Party told me recently that since the island’s independence from the British in 1948, no matter what government is in power, the same dozen-or-so families run it. When information only flows through a privileged few, it’s hard for those outside to disrupt the status quo. But last year, something changed: parliament passed an expansive right-to-information law, the first of its kind in Sri Lanka. The act gives Sri Lankan citizens the legal right to access information at all levels of government, with few exceptions. Whether that right is being observed by government agencies is a different question, though, and one worth interrogating. This column, going forward, will keep readers updated on the data, records, and documents we are trying to wrangle out of various government bodies, and how we are being met in our effort. It will also share the stories of private citizens filing their own RTI requests, who are often met with suspicion and resistance. Many are actively fighting for their right to information, with the help of legal aid organizations, Transparency International Sri Lanka, and their experiences need to be reported. When parliament first passed the RTI Act, many human rights advocates hoped it could be used as a new way for family members of people who were forcibly disappeared during the civil war to unearth new information about their loved ones. For years, these families have been rebuffed by various commissions created to investigate the disappeared. Amnesty International estimates that since the 1980’s, between 60,000 and 100,000 people were kidnapped by police, military, and paramilitary forces. But, information on their fate is scarce, and promises from the highest levels to release “lists” of people who surrendered to the army in the final months of the civil war, remain unfulfilled. RTI’s ability as a tool for these families to pressure the government and its security apparatus has not been fully tested. In theory, government agencies could deny these requests, citing a threat to “national security,” though they would have to explain how such a disclosure would actually pose a threat. Last month, the Daily News submitted a request under the Right to Information Act to the country’s Human Rights Commission to see how many people are using the new law as an avenue for information. The commission was well-prepared for our request, and followed the RTI Act to the letter. I initially sent our request, by email, to the commission’s media spokesman, Commissioner Saliya Pieris. He responded the same day, telling me he was not the designated information officer, but that he’d sent our paper’s request to the right person. Under the law, every government agency must appoint an information officer, or multiple information officers, to process the public’s requests. The information officer the Human Rights Commission is W.A.U.S. Wijesooriya. We got our request back within the 14-day time window, and it was illuminating: of all the requests the Human Rights Commission had received since the law went into effect, over 40 percent of them sought information about disappeared persons. The commission had not denied a single request. We have since filed RTI requests with the Ministry of Defence, the Department of Prisons, and the Bureau of the Commissioner General of Rehabilitation. We haven’t received confirmation that our requests were received, but the agencies still have time to do so. Unlike the Human Rights Commission, our experience with the Ministry of Defence was problematic. I initially tried to figure out who the ministry’s information officer was over the phone, but after speaking with multiple people, it was soon clear no one had any idea what I was talking about. So I delivered the request by hand. I was first sent away from the Ministry’s Headquarters off Galle Road, and sent 3 kilometres south to their press office. There, security guards told me to go back to the main headquarters. Finally, a press officer took my request and promised to get it to the right person. He called me the next morning to tell me he would deliver it by hand back to the main headquarters. I’m hopeful we’ll get a response from them soon. Court reporters say the Supreme Court of Sri Lanka has a huge backlog of cases, which is fuelled by the frequent absence of judges. Even high-profile cases are not immune; the Fundamental Rights petition filed by Naomi Coleman, the British woman who was arrested for having a tattoo of the Buddha, has been postponed close to a dozen times since June 2015, after the judge presiding over that case retired without delivering judgement. We initially filed an RTI request with the Ministry of Justice’s information officer, Additional Secretary A. Mansoor, to see how many other cases have been delayed because judges were absent from the bench. Mansoor responded eight days later, telling us that his ministry did not have the information, and that a request should be filed with the Registrar of the Supreme Court. That’s where our luck ran out. The next week, I called the office of the Registrar of the Supreme Court on an almost daily basis, asking for the name and contact details of their information officer. But, the secretary repeatedly hung up on me. I sent the RTI request to an email address I found on the Bar Association of Sri Lanka’s website, but received no answer. Finally, I delivered the request by hand to the Supreme Court’s mail room last week. Under the terms of the law, they now have 14 days to mail us a receipt of our request, and tell us if they will be able to fulfil it or not. 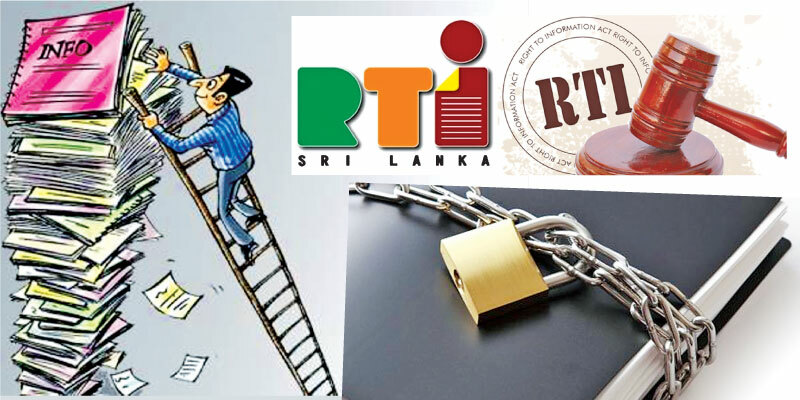 The RTI Act, as it is written, has the potential to transform the way Sri Lankans interact with their government. But, in our short experience using the law, bureaucracy and ignorance are often barriers to information. We will keep publishing the names of information officers here, and detailing the filing process, as a roadmap for anyone looking to file their own requests under the Right to Information Act. But, even more important, moving forward, will be to tell the stories of private citizens exercising their right to information. Out on the ground, some civil society groups and information activists have reported that people are being met with intimidation and police questioning after filing RTI requests with local authorities. My hope is this column can start bringing some of these stories to light. Stay with us.